FSMIS (May 9, 2015): In the late afternoon of May 8, 2015, Federated States of Micronesia President Manny Mori completed his review of a number of pardon requests that have come before him. Mr. Cholymay, Mr. Engichy, Mr. James Fritz, Ms. Nakayama, and Mr. Petewon were convicted of criminal conspiracy in violation of Title 11 of the FSM Code Sections 203, 529 and Chapter 55 Section 221(2) (3). Title 11 Section 203 contains various conspiracy crimes while Section 529 under the same Title has to do with the tampering of public records and information. Mr. Innocenti, convicted in April 2006, and Mr. Kansou, convicted in 2008, were guilty of criminal conspiracy in violation of Title 11 of the FSM Code Sections 203, 529 and Title 55 Section 221 (2). Title 55 covers Finance and Contracts. Section 221 of this Title specifies violations relating to the over obligation of funds. In November, 2007, Mr. Jack Fritz was convicted of four charges of fund obligation in violation Title 55, Sections 221 (3) and 222. Mr. Wainer Louis was convicted on March 9, 2007 for illegal possession of firearms in violation of Title 11 of the FSM Code, for which he was imprisoned for two years, which included a one-year suspension. The FSM Supreme Court also found Mr. Tadasy Wainit in July, 2006, guilty of the offenses of unlawful threats, improper influences in official and political matters, and resisting arrest, for which he served two years sentences. According to the pardon documents, the authority to grant a pardon vests in the President pursuant to Article X, Section 2 (c) of the FSM Constitution. The pardon documents also state that Article IX, Section 9, "provides that a person convicted of a felony by a state or national government court is ineligible to serve in any elected positions at the national level". All the pardon request packets made available to the President include letters of support from various government, church and traditional officials. President Mori had indicated through an interview earlier this week that he would consider a pardon request on the condition that the person has completed his or her sentences rendered by the FSM Supreme Court. 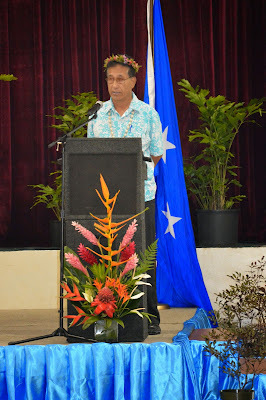 Hats off and salute to His Excellency, Emanuel Mori, President of the Federated States of Micronesia. Kalahngan, Kinisou chapur and Millions of thank you. This is a slippery slope for which the FSM would forever regret.